The Book of Deuteronomy (second law) is a summary of God’s teachings to help guide God’s people as they leave the desert and enter their new and promised home-land Israel). Moses reminds them they have been looked after and loved so beautifully that the only proper response to God is to return love. ‘Love your God with all your heart’. Have you ‘taken into your heart’ God’s love and care for you? Jewish people still treasure this ‘command’ to hear and remember. Devout Jews wear this prayer in little prayer containers (phylacteries) on their wrist and forehead, pray it morning and evening, and have a container at the doorway of their home which they touch to remind them to love God who loved them. How could you be reminded of God’s love each day? Where could you put a crucifix so that it is a daily visible and touchable reminder as you ‘come and go’ in and out of your home? The Letter to the Hebrews is written for Jewish christians who are struggling and tempted to return to the practices of the temple, the laws, the sacrifices. Jesus is shown to be the true and perfect high-priest who will never die and whose sacrifice on the cross forgives ‘once and for all’. Do you ever think something else needs to be done to forgive you? Make you acceptable? Do you find yourself holding God’s love at arms length until you become perfect by your own actions? What practices or traditions do you long for that used to make you feel well? Jesus is now in Jerusalem. He has chased out money changers from the Temple, had arguments with Pharisees and Scribes. Today a frequent faith question is discussed. Jews believed that 613 laws were developed from the 10 commandments. Living all these laws put one in right relationship with God. Scribes who were teachers of the laws especially to the younger generation were often asked: Make it simple? Which is the greatest? Jesus quotes from Dt 6, 4 (1st Reading) but also adds Lev 19,18 – care of the poor (check out Lev 19.9-17). 613 becomes 2. 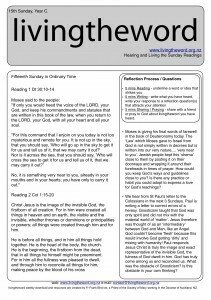 How do you move from love of God on Sunday to love of God on Monday? Do you find it easy to separate love of God from love of neighbour? How do you see this in your life? In the Church? The Prophets of the Old Testament constantly pointed out the ease at which people worshipped in the temple with ‘burnt offerings and sacrifices’ but did not love their ‘neighbour’ shown by helping others in need. Love of God draws me into a relationship with all whom God loves. God painfully wishes our love to be extended to lift up the lowest and forgotten in society. Imagine entering a home for dinner and saying nice words at the table. Upon leaving the house kicking the children and scratching the hosts car. What is going on? The scribe agrees with Jesus. But Jesus says things are still incomplete: ‘you are not far from the Kingdom of God’. Close but not there yet! Your head is ‘on board’ but is your life going to truly show direct ‘action’ linking God AND Neighbour? The crowd stayed silent. Why? What would it involve to actually live and love neighbour as your own flesh and blood? 7th Sunday Yr B – how far would you go to help a friend? God makes a promise through Isaiah to do ‘something new’. God will lead them out of captivity in Babylon and back ‘home’ to their promised land. A path will be clear, rivers for water in times of thirst will be provided. Are you able to ‘perceive’ God helping you with a ‘path’ and ‘water’ today? How? God reminds them of sin, lack of praise, lack of prayer, crimes. But joyfully lets them know these have been ‘wiped away’. Sin and the past is not being ‘remembered’. Do you play over in your head and heart past ‘sins’? Do you live more in ‘sin’ than ‘forgiveness’? What conversation would you like to have with God….. with a priest in the sacrament of reconciliation? St Paul has had difficulties with the community at Corinth. He promised he would visit them and then instead sent Titus (hoping he may have more success!) People accused Paul of being ‘yes’ and ‘no’. He says one thing but does another. Has this criticism been made of you? Do you keep promises made by your words and fulfill them with action? Paul explains himself and points to Jesus as being utterly faithful and the complete ‘Yes’ of all God’s promises. Mark chapter 2 begins a series of conflicts with religious authorities. Scribes (religious lawyers) who contained God – taught what God was like and laws that were to be kept – are upset that Jesus makes a claim to ‘act in the name and with the power of God’. They charge him with blasphemy – pretending to be God! How do you understand Jesus’ words and power to heal and forgive? Is Jesus the predicted ‘Son of Man’ (Book of Daniel)? Is he truly who he claims to be? The loyalty of the friends of the paralysed man attracts Jesus’ attention. Imagine going to the extreme lengths of ripping open a roof so that your friend could be restored to life. Do you and your friends know someone in need of help. What would opening up the roof for them involve? Will you do it? The Gospel today reveals two typical responses to Jesus (christians, Church): critical or captivated. A theological question of ‘who’ Jesus is refuses to be open to suprise. An acceptance of what he does leads to astonishment. Who is this person Jesus and where does he get his power from are questions beneath the surface of this gospel story. We are drawn personally into this question. What is your response? As Jesus cures and heals so many people in the gospel of Mark, we can feel left out and unable to ‘follow’ him in his words and deeds of power. It is significant to realise there are physical (cures) and social (healing) elements. We are not always able to ‘cure’ but we can frequently enable healing – the reintegration of a person back into families, society, worship. Like the helpers today, how could you ‘heal’?